The Pope just wrote a long letter to the Catholics in China. It was actually a letter to the Church, to the Government and to the world. It is one of those day-to-day reasons I am so proud to be a Catholic. My old Baptist church could never have pulled this off. I am still reading the letter Pope Benedict wrote, but whaI've read so far is brilliant, heartfelt, profound, and very savvy. He is walking through a mine field. You can read the letter here on the Vatican website at www.vatican.va. 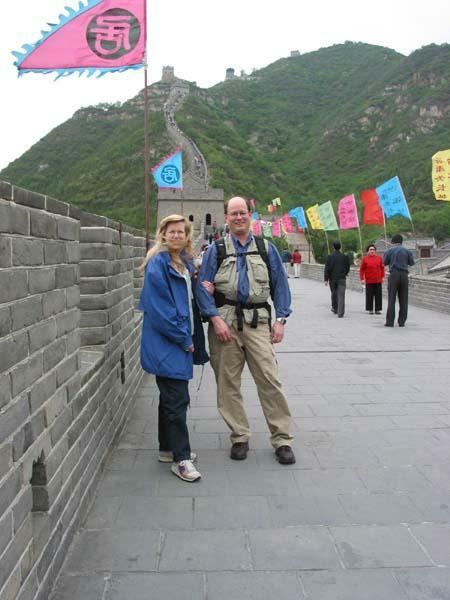 Janet and I traveled to China a while ago to see the country for ourselves. 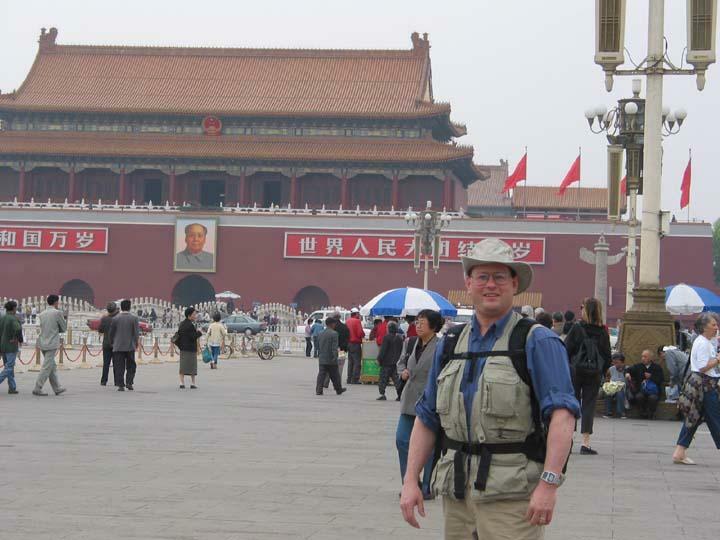 We wanted to walk of the Great Wall, see Mao's Tomb and Tiananmen Square and meet some local Catholics. All that we did. We even saw the Panda Bears. It was a bizarre country. Moms and dads walked around everywhere with their one child, bikes filled the streets like cars do in New York and there was no blond hair to be seen for miles — except my wife's. People were friendly but reserved. You could see the old way with Mao uniforms worn by older people but the younger people were trying to be free. In the mornings parks and open areas were full of people out in groups exercizing in unison. It is the last real communist regime (except for N. Korea and Cuba) but at the same time China is an example of capitalism run wild. We called it the "Wild, Wild East." There was a joke the Chinese told while we were there. "The President of the US is riding in China and comes to a fork in the road. Signs pointing to left and right read "Capitalism right" and "Communism left." The US president shouts "Turn right!" The next week the N. Korean president comes to the same intersection and yells, "Turn left!" A week later the Chinese president drives up to the intersection, thinks for a moment then shouts "Turn left, but go right!" 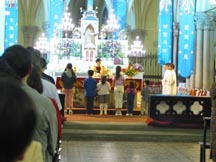 We went to Mass in Shanghi. It was an amazing experience. 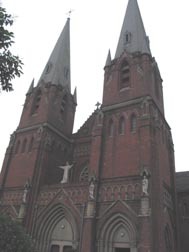 It was the authorized Catholic Church — above ground, with bishops appointed by Beijing. It was a beautiful old Catholic Church filled to the brim with people. Large TV monitors were providing the songs and readings in Chinese and English. Everyone was exceedingly devout and reverent. Many arrived early to pray the Rosary. The Mass was celebrated with much care and the homily was exceptional. The Chinese Mass would put many American parishes to shame. No one got up and left early. After Mass many gathered at the Marian Grotto near the Church for more prayer. I asked questions — though many could not speak English or didn't want to talk. I could understand their hesitation. But we finally found a man who could speak English and was not afraid to talk with us. I asked him about the Church. He said the "legal" Church, the one above ground is full of people and he thought it was good. He said it provides the Sacraments to the hungry who would otherwise not have the Church or a priest. My guess is that belonging to the underground Church is dangerous and inaccessible to most Chinese. I asked him what the big difference was between the State Church above ground and the illegal Church functioning underground. 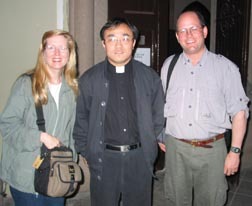 He stated plainly, "The state Church is loyal to Beijing; the underground Church is loyal to Rome." I still have not decided what to think about the above ground Church though my loyalties lie with those who suffer to practice their loyalty to the Vicar of Christ and to express that unity with the universal Church even though it means martyrdom. I am glad I am not Chinese and forced to make that decision for my family. I appreciate my easy Catholicism, but …. if I was there, what would I do? We have friends we work with in the Philippines who do business inside China. Our friend Henry is Chinese by nationality though now a Filipino citizen. I asked him lots of questions and it was he that told me his bishop said it was OK to visit the state church while in China. He said the priests are good men who work within the system to provide the sacraments to the faithful. He said they have decided to serve God in this capacity. I think in their hearts they are loyal to Rome, outwardly they have to play the political game to bring Christ to the faithful. Having been there we have more of a sense of urgency and prayer for these good folks stuck in a meat grinder. I pray the Pope's letter opens the door to cooperation and that Chinese Christians will feel some relief. I pray especially for all the heroes — the bishops, priests, religious and faithful who daily live under tremendous fear, deprivation and persecution. Even the "one child policy" is a source of extreme persecution and fear. The country also scares me since there are 1 billion people living under an oppressive communist atheistic regime. Every e-mail in and out of the country is censored. Peoples' lives are controlled. We know that even on our trip we saw what they wanted us to see. We were never left alone — we always had our guide and driver to make sure we were well "guided" to the places we were allowed to see. When we talked to people, many of them had never heard of Jesus or Moses. They knew nothing of the Ten Commandments or the Bible. We even had a "security" man forbid some waitresses to serve us any more because we had begun to talk to them about Jesus. He rushed over and pushed them away. What happens when a country like China which is becoming extremely powerful, atheistic — what happens when they begin to flap their wings and intentions to express themselves outside their national boundaries? I think it is only a matter of time. And on the other hand we have 1 billion Muslims. Does the West still have a spine? What will the world look like for our grandchildren? (I have another article like this about Islam entitled Prepare for the Skyline of the Future). I will be watching to see what comes of this letter. I pray the good people of China will some day smell the fresh air of freedom, just as they have the strong wind of capitalistic enterprise. I hope the Christians feel the breath of the Holy Spirit as they read the letter of Our Holy Father. I pray it gives them hope, consolation and a sense of unity with the Church Universal. I am proud to be Catholic, not in a bad way, but in a way – a way that causes me to say "Thank you Lord for allowing me to be part of your maginificent Catholic Church. And Lord, help my brothers and sisters in China as they too are devoted to you and to your Church. Bless the Bishops, priests and religious as they suffer to bring Christ to their world. Amen!"